The Bloomin’ Barbeque & Bluegrass Festival is an annual street festival in the fun town of Seviervile, just up the road from Pigeon Forge. Happening in the latter part of May, it’s a very family-friendly event with kids activities,championship barbecue and world-class bluegrass music. The festival takes place in Sevierville’s historic downtown, and it’s Free Admission, with free concerts, and lots of food to sample and to buy. Nearly 40,000 visitors a year are attracted to the event’s great mix of music, great food, fun and local crafts. Here’s what you need to know. Every year the Bloomin’ Barbeque & Bluegrass Festival has some of the best bands in the region playing. You’ll be entertained by live music during the celebration, letting you get a taste for musical greats and up-and-coming local artists from throughout the area. There is also a vocalist contest in two age groups, featuring covers of selections from Dolly Parton’s more than 3,000 penned songs. In an area packed full of musical talent, the festival offers a chance to hear some astonishing performers at the start of their careers, as well as the solid professional bands booked for the event. You can find complete playlists and all other details on the official Bloomin’ BBQ & Bluegrass Festival page. Barbecue is the word of the day here, with mouthwatering sauces and melt-off-the-bone meats abounding. The festival offers a state championship Barbecue Cookoff, where judges pick the best teams’ fare and award prizes. Naturally, visitors get to taste the food, too. In the past, around fifty teams have faced off for the win, so there will be plenty of barbecue for you to sample. This festival is a real hit for families with younger kids. There’s a fun zone where children of all ages can explore bouncy houses, enjoy trampolines, ride the trackless train, and many other activities. Your budding artists can also show off their skills with chalk art at the children’s arts and crafts section. 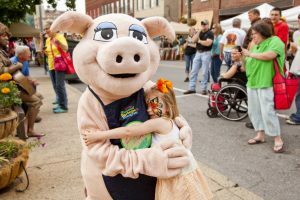 There’s also a giant pig mascot who will wander around, sharing hugs and good cheer and making for a great photo opportunity. Please note that some attractions in the kids zone have a nominal charge. Bluegrass and barbecue is just the tip of the iceberg at this festival. Local craftsmen and artists will be showing off their best work and offering great take-home gifts including handicrafts, portraits, jewelry, handmade soaps and lotions, and scented candles. Come with a big appetite. There’s a lot of delicious food to chow down on. Wear comfortable shoes. There can be a fair amount of walking. Prepare for crowds. This festival hits during the tourist season and draws people from across the South. Bring your camera. You won’t want to miss a minute of the fun! Book a place to stay well in advance. Accommodations in the Smoky Mountains can fill up quickly. Drop By the Bloomin’ Barbeque & Bluegrass Festival in Sevierville! 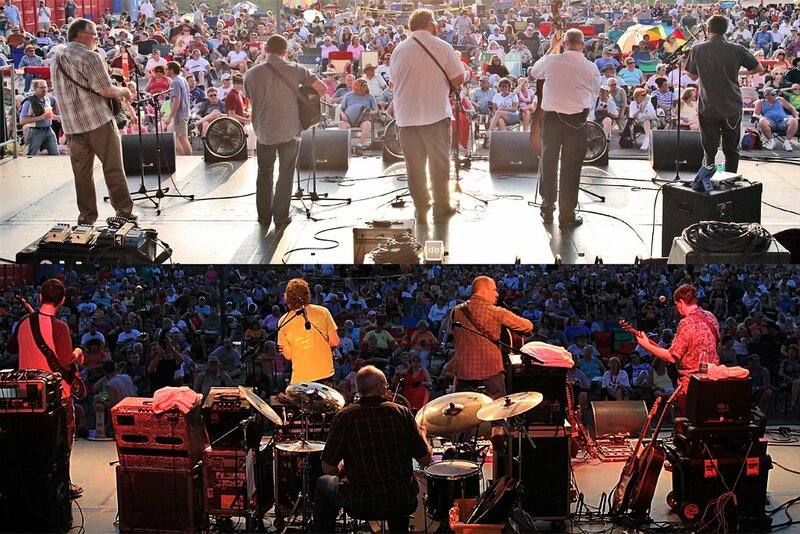 The Bloomin’ Barbeque & Bluegrass Festival runs from May 18 to 19 in Sevierville, TN. The town is located on Highway 441 north of Pigeon Forge and Pine Grove, and is just a short drive outside of Knoxville, TN. Entrance and music is free, although some activities have a small charge. For more information, visit the official festival website. You can also email them at [email protected] or call them at 1-888-738-4378. See our write-ups of the 2013, 2014 and 2015 festivals. And for accommodation during the festival, you can’t beat a cabin for the most fun. Distances are no more than a few miles between Gatlinburg cabins and Pigeon Forge cabins. And don’t forget our Wears Valley cabins – on the “peaceful side” of the Smoky Mountains and with very easy access to Pigeon Forge and Sevierville. Make a longer stay here and take advantage of our Pigeon Forge coupons – over $400 of free tickets to some of the best local attractions. Call us 24/7 at 855-91-SMOKY to book or just to ask questions. And if you didn’t book in advance, keep an eye out for our last minute specials – often as much as Half-Price on remaining cabins – perfect for a weekend festival!